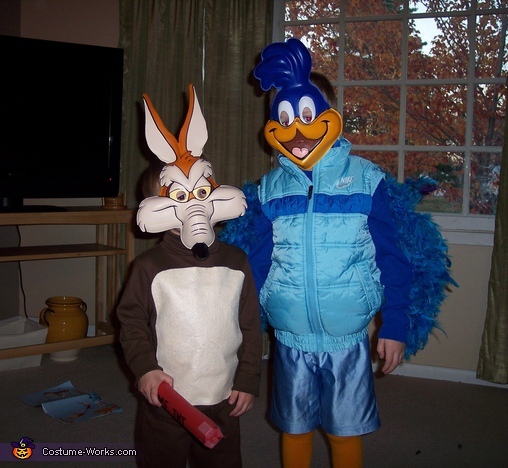 My five year old son is dressed as the Roadrunner from Looney Tunes and his littel 2 1/2 year old brother is Wile E. Coyote. 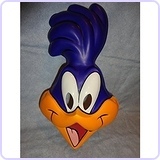 My 5 year old loves Looney Tunes and he suggested the idea. For the coyote, he wore a brown turtle neck with a piece of tan felt stitched to the front. He also wore a pair of brown sweatpants with a tail attached. He is carrying a homemade stick of ACME TNT. 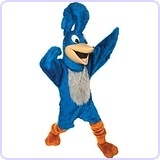 The roadrunner is wearing yellow soccer socks with light blue shorts. He has a blue long-sleeved shirts on with a light blue vest. I took a boa and cut it apart and pinned it to the sleeves of the shirt. For the tail, I took 2 blue feather dusters, a turquoise feather, and a purple feather. I used blue duct tape to attach them together. Then, I duct taped them to a belt which he wore under his vest. The masks were purchased online. thank you! 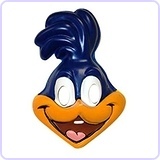 it will perfect for my future Roadrunner this year. Checking for items on line now.